The cone-shaped sugegasa is one of the traditional accoutrements that marks a Shikoku henro ("pilgrim"), but, of course, in modern Japan, not all pilgrims wear it. 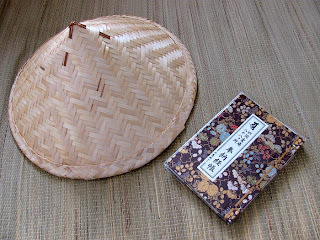 Ball caps and bicycle helmets (for those undertaking the pilgrimage by bike) are perhaps more often seen than the sugegasa. The important thing is the pilgrimage itself which, or course, means different things to different people. Some do the pilgrimage for religious reasons; others to commemorate loved ones; some to reflect on their lives; some for recreation; some to find themselves. There is something magical about setting off on a pilgrimage of this nature. As you walk, the world reduces itself and things become more simple...you and your steps one in front of the other. You can't help but think about all the others who, over the course of nine centuries, have passed this way before you. As with long distance hiking routes in the States (e.g. the Appalachian or Pacific Crest trails), some folks on the Shikoku pilgrimage do the 1,200+ kilometers in one go. Others do portions of it over the years until they finish it. I think I will be in that latter group. Well, I am now back in Portland, Oregon. I've hung up my sugegasa and carefully stored my nōkyōchō until he next phase of the journey begins. Lovely, John. When oh when will you lead this eager pilgrim on an 88-temple tour?